The Hypermax 6.9/7.3L Ford diesel water injection system is designed for high-performance applications such as truck pulling and drag racing. Controls exhaust temperatures to desired level electronically. 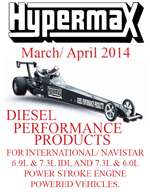 The Hypermax 7.3L Power Stroke diesel water injection system is designed for high-performance applications such as truck pulling and drag racing. Controls exhaust temperatures to desired level electronically.